So, I was assembling a bicycle the other day, and it was a pretty nice bike, and it came with the CPSC-required reflectors on the front, rear, and sides (in the spokes) of the bike. Like all serious cyclists, I took the reflectors off. They seemed to be optimized for easy removal. I examined them for any alternate uses, and couldn't come up with one. Even the screws were too cheap for me to want. 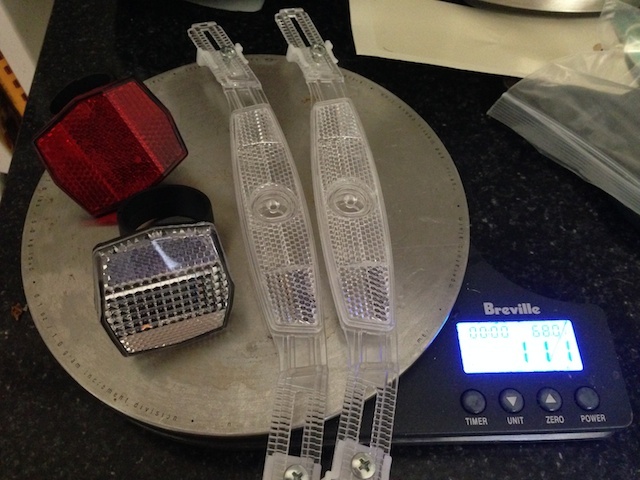 Every bike usable on the road and sold in the US (as the impressively clear and plain-language CPSC document I linked to above explains) must have these reflectors, and it appears that in practice, that extends to Canada as well. In the US, that was about 18.7 million bikes in 2012, but as that National Bicycle Dealers Association goes on to explain, 75% of those bikes were sold by, more or less, department stores. Let's use that as a rough and ready proxy for all the children's bikes and cheap bikes that either aren't required to have reflectors or didn't have them removed, either by accident or on purpose. That leaves us with 25% of all bike sold via the internet, through specialty retailers, or through sporting goods stores. With some handwaving, these are the proxy for "good" bikes. I'd estimate that nearly 100% of those good bikes have their reflectors removed and thrown away. This is done because they're ugly, and because any serious cyclist is likely to bring lights at night, since reflectors are risibly inadequate for night riding (and as far as I know, in most jurisdictions local laws make riding a bike without lights at night a ticketable offence). I might have tossed the reflectors, but when I go out at night, it's with about $50 worth of lights blazing away, including a front unit that puts out about as much light as my car's headlights. So if we say that 25% of all reflectors that accompany bikes in the US are just tossed straight into the garbage, that's about 468 metric tons of trash that is created by stuff that exists only to satisfy a government regulation while the bike is sold to the final consumer, at which point it is tossed, unused, into the garbage. (This hardly defines the magnitude of the problem: it takes about 20 cents of labour to remove the reflectors at bike shop wages and speeds. It's arguable that none of the reflectors do any good, which would suggest that eventually, not quite 2000 tons of trash is created each year. Their production cost is non-zero (though I'd guess they cost less than a dollar per bicycle wholesale, so in total this regulation only wastes about $4-20 million per year)). This isn't about how all regulations are bad, though this regulation seems to be very bad indeed, as in people arguing it leads people to their deaths). It's not even a very big cost. Sure, it might be worth it for some entity to spend a few million dollars getting this regulation fixed, but the likelihood of some sort of opposition and attendant unpleasant backlash ("BIKE COMPANY LOBBIES FOR LAX SAFETY RULES: CHILDREN IN PERIL" could be a fun headline; mandator lighting systems on bikes might be even more fun) are likely what keeps it on the books. Heck, if you're a company that makes bikes and already knows how to navigate the safety rules, then they serve as a pleasant barrier to entry in your market. The real problem is this one tiny little law--this law that creates a few million dollars worth of useless goods, creates 468 tons of trash, and uses up about 78,000 hours of labour in removing and throwing away that trash (annually!) --is very far from the only one. But this particular law weighs 468 tons, every year.